As I began my PhD journey 3 years ago I never thought it would lead to exploring economic models. In my graduate program in the 90s I had taken two semesters of economics and healthcare finance and I must admit it was painful. I considered those courses my foreign languages. As a nurse, I was and continue to be all about the patient and the staff and what was needed to provide care leading to well-being and health. My dissertation vision was clear, I would create an Integrative Healthcare (IH) System Model, a road map for creating and evaluating true IH systems. Through my experience as a nurse, I had served in many roles at many levels within healthcare organizations. I had seen gaps in care; gaps that often led to less than a state of health and definitely not well-being. As you can imagine, my earliervision of an IH System Model has shifted slightly but continues to be at the forefront of my passion and research focus. I continue to be drawn to work on healthcare systems that are able to actually create health and well-being, not just treat diseases and symptoms. As I discussed the needs to move integrative health forward with the IH “people in the know” it always came down to economics. My inquiries were met with a common response:“We need to be able to economically support integrative health systems for them to be accepted and implemented.” Well, these suggestions made me very anxious. Because of my experience in graduate school I felt that economics was definitely not a knowledge area I wanted to revisit. However, as I thought about our current healthcare system, I realized that we currently live in a culture where government, policy, and business decisions are based on the bottom line of money. Eisenstein (2011) observes that when looking at an issue and asking the question, “Why?” we find that it usually comes down to money. This certainly was true in my healthcare system research. I first thought emphatically that we have many single non-patient centered drivers in our healthcare organizations such as reimbursements, regulations, liability concerns, insurance coverage, pharmaceuticals, special interest groups, etc. and so we need to institute a patient-centered care umbrella over all of those requirements. However, upon exploring each of these healthcare drivers I learned that it came down to money and economics for each of these. We do not typically see initiatives tackled unless they can be justified financially. We define success as not just covering costs but also creating a certain profit margin. Often we make business decisions solely on the basis of money and without accounting for the short term or long term damage that may result to our environment and the species (including human beings) inhabiting our planet. As I explored the economic aspects of the healthcare system, I reflected upon my own economic and financial experiences in graduate school, work, and life. I realized that my reluctance to delve into the economics of IH Systems was based on the knowledge I had studied earlier in my academic career, but this knowledge did not represent the whole picture. It did not take into account the well-being of individuals, or how an economic system might damage those whom it was supposed to benefit. This realization resulting led me to ask: Would the traditional economic model ever support the creation of IH systems? It seemed the human benefit of achieving a higher level of well-being by a team of interdisciplinary practitioners would be much greater than that obtained by measuring GDP or through other traditional economic measures. Viewed from a “systems way of thinking” our traditional economic models do not appear to capture real economic strength, human health and well-being or opportunities to achieve each human being’s real capability. Lips, Wiersma and Morris ‘s (2011) well-researched Holistic Development Model, describing the tensions between being and doing, and the self and other, along with the need to be balanced between four quadrants: 1) Developing the inner self; 2)Unity with others; 3) Expressing full potential and 4) Service to others. Buber’s (2000) work on the “I – Thou” relationship and approach to interactions. Johnson (1996) Polarity Model which describes the tension and need to understand the positive and negatives of both sides of a wicked problem. These are just a few of the models and research that resonated with me and guided my thinking about what I perceived as a wicked healthcare system problem, providing patient-centered care in an environment that supported economic drivers. These models not only provided a knowledge and research foundation for new ways of doing life but a language for the discussions that are needed to shift individual thinking, climates and cultures. About the same time I was moving toward the importance and use of economic models in my IH research, a friend more than once recommend the writings of Riane Eisler. Riane had written The Chalice and the Blade in 1988 and my friend found that these writings had a direct impact on who she is and the work she does today. So, after the 2nd or 3rd time that my friend made this suggestion (not knowing about my IH and economic focus), I finally began to explore this writer. The first thing that surfaced when I began to search for Eisler’s work was a book she released in 2008, The Real Wealth of Nations: A Caring Economy. I immediately downloaded this book on Kindle and began reading. From the first page I resonated with Eisler’s ideas and the new model of economics that she proposed. I realized the reason I had struggled with the traditional economic models in the early 90’s was there were critical pieces missing, pieces that were needed to demonstrate real wealth; real well-being of the humans, animals and planet. Adding to the traditional model of economics (Market, Government, and Illegal economies), Eisler proposed a model that includes the unpaid community, household and natural economy. The household economy is seen as a core piece of the new economic map: not just a unit of consumption but one of production, the production of people. How people are cared for impacts the strength of our economy. In the unpaid community sector volunteers working for charitable purposes or community development at times represents a barter system and also involves caring for others. In regards to the natural economy sector, nature is also a producer of resources.When these resources are exploited and used without thought for the future and total impact we see disastrous effects. Eisler (2008) proposes that all of these additions to the old economic tradition work and interact together to create real wealth. The example that really convinced me that we have been missing critical pieces was the account of the Exxon-Valdez oil spill. In the traditional economic model this disaster would have been measured as a positive gain in our Gross National Product (GNP) and Gross Domestic Product (GDP). The GDP indicates growth of a nation based on the value of everything reported being produced within the borders of a country by any company, foreign or local. Whereas the GNP is everything produced by only that country and does not include foreign countries operating within a country. Even though these measures may not include everything produced or those things that are not reported, the logic is that year-to-year comparison of these performance measures shows a growth or deficit even though they may not measure everything of value. While all value is attributed to growth, the effect of the environmental devastation is not taken into account in those measures. As I continued to explore Eisler’s Caring Economics Model, by completing the Caring Economics Conversation Leader training program, and interacting with the program staff, I became excited about supporting the change in the healthcare system with economic terminology, but now with an expanded economic language; a more complete description of the economics involved. My next step was to search for other humanistic model experts and see what else was out there. I chose to call these humanistic economic models because these models focus on the human component, the interests and well-being of humans. Two out-of-the-box economic experts emerged, Charles Eisenstein with Sacred Economics (2011) and E.F. Schumacher, with Small is Beautiful (1975). E.F. Schumacher was born in 1911 in Bonn, Germany and died unexpectedly while on a trip to Switzerland in 1977. But his work lives on through his writings and the work of the Schumacher Center for a New Economics located in Great Barrington, MA. He studied at Oxford and Columbia University earning a degree in economics. He worked in business, farming and journalism. While working in Burma in 1955 he developed a set of principles known as Buddhist economics based on the premise that individuals need good work for human development. He is recognized as an economic thinker, statistician and economist. You can find more about his life and the Schumacher Center online at About E.F. Schumacher. The economic concepts that Schumacher brought forward includes “user friendly, ecologically suitable and appropriate technology”; local currencies, and “commons approach” for environmental sustainability. By exploring the work of these out-of-the-box economic thinkers, there are several themes that I can take into my healthcare system work. These include first and foremost the context to support the development of each human being and all species on this planet. Within the healthcare sector there are many caring individuals providing services that are based in the practice of caring, and these new humanistic-based economic models give those caring professionals a sense of value. 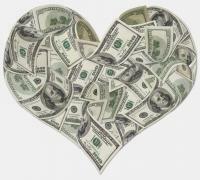 The understanding of our history and current relationship with money is a critical foundation to move forward with appropriate communication and action. The question is and will be: How do we as individuals each work to change something which is so engrained in our society and daily lives; something that we are often caught up in which so often makes us behave without thinking, because it is just the normal thing to do? We assume it is what is expected and what is needed to survive. However, these experts and their research give us a language and understanding that, if considered and adopted, might just make a difference in our lives and our future through one interaction at a time.